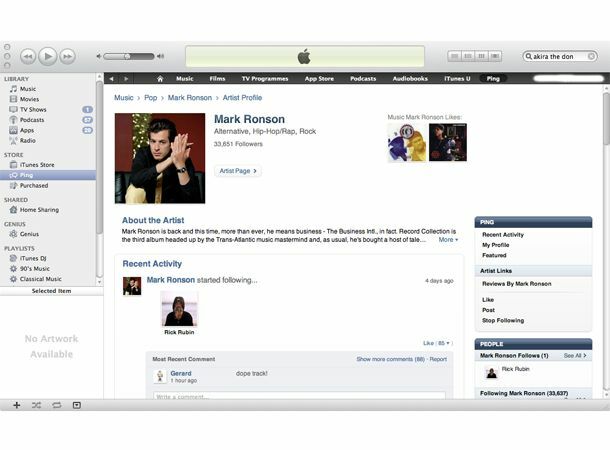 Ping is Apple's music social networking solution, and an obvious rival to Spotify and Facebook. Integrated into iTunes 10, use it find out more about the artists you like, discover new music, and as well as what your friends are listening too. Setting up a Ping account is easy. You need to initially set-up a bio where you add a bit of information about yourself and add a photo. Originally Ping was going to be integrated within Facebook, and it's a real shame the two companies couldn't agree terms because the social side is very thin on the ground. Unlike Facebook, Ping is still in its infancy (1 million users isn't a lot worldwide), so doesn't have the wide selection of users and neither does it have friend suggestions, so it's a question of finding someone you know and hunting through their contacts to find more people. The privacy settings are far easier than Facebook though, you can either allow everyone to follow and approve or ban followers. When you set-up your profile you can only choose a maximum of three music genres, from a potential 21 – why not more? There is also space for 10 favourite artists displayed by albums cover, which you can select manually or alternatively Ping makes selections based on your iTunes music. If you've got a varied collection where there's a chance an odd embarrassing 'Three Lions' or 'Spaceman' can creep in we'd suggest the former. Because Ping is still in its infancy, music choice is very limited and currently it feels like a portal for the big record labels to promote artists, rather than a chance to discover new music. 35 artists were recommended to use, the majority of them mainstream commercial choices like Lady GaGa and Soundgarden, with very little in common. Artist bios read typically read like third person record company biogs, although some artist comments - like Lady GaGa - sound more human or are just very cleverly marketed. Ping would have been a great way to share music - if you could listen to more than 10 seconds per track when you click through to a profile. Whether you are following someone new, buying music or commenting on a track, all activity is displayed on your personal feed, where followers can add a comment or 'like.' Unfortunately there's currently no method of notification when someone posts something new. Ping aggregates your iTunes games, apps and book reviews, so followers can read what you've originally reviewed via your iTunes account. Ping also works on the iPhone 4 and iPod Touch where it's accessed via a separate tab at the bottom of iTunes. The whole experience is far quicker than using a computer: pages load quickly and multitouch controls of the iPhone 4 make it easy to flick between profiles and add comments. Ping's an interesting idea, but it needs time to prove itself. This is partly because it's so new - there just aren't enough musicians on there to find out about or friends to share content with. The computer interface is also a bit clunky, so finding people can be slow and very often the main menu disappears so you have to click the 'Ping' tab or go the back arrow to bring it up again. While we applaud the simple privacy settings, it would be good to have some notification when someone posts on your wall? Ping's success also depends on people buying and sharing music through iTunes, and that's not something everyone wants to do – especially next to Spotify, where not only can you share playlists, but you can also listen to full tracks - without paying a penny. Until that fundamentally changes and until more people start to use it, it's hard to get excited about Ping.